One of the most prominent names in modern Indian history, Ramachandra Guha, has qualified the act of pulling down VI Lenin's statues in Tripura as the "price of dogma" paid by the Communist Party of India (Marxist) or CPI(M), wondering, "What if the CPI(M) had installed statues of Bhagat Singh in Tripura? Would they have been vandalized by the BJP cadre after the CPI(M) was voted out of power in that state?" Even as saying that "the triumphalist supporters of the BJP who brought down those statues of Lenin in Tripura are worthy only of contempt"', and insisting, he does not share "the BJP's xenophobia", Guha says, he also disagrees with the BJP justification for bringing down Lenin's statues because he was a "foreigner." According to Guha, "Great human beings transcend national boundaries. I would be happy to have statues of (for example) Nelson Mandela, Martin Luther King and Václav Havel installed in our cities and towns. But living as I do in a democracy, I would draw the line at dictators." "The problem is not that Lenin was a foreigner, but that he was not a democrat", Guha says in an article in a top daily, adding, "Lenin was a tyrant, a despot, who first subordinated his country to his party before subordinating his party to himself. He had his enemies and rivals killed, placed curbs on the freedom of intellectual and artistic expression, and paved the way for the even more brutal dictatorship of Stalin." "Lenin, incidentally, would have been a super-troll in the Age of Twitter", argues Guha, adding, "For he was a vindictive man, abusive in his writings and in speech. His hatred was not reserved for the bourgeoisie; socialists who disagreed with him were savagely set upon as well. Among those who attracted Lenin's ire was the German Marxist, Eduardo Bernstein, who had rejected violent revolution in favour of peaceful democratic change." 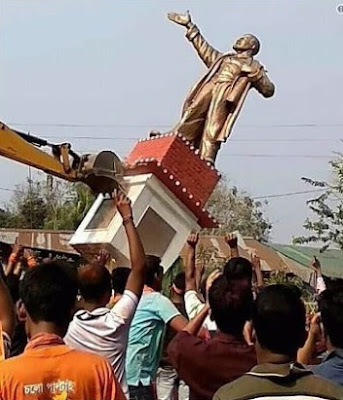 Underlining that Bhagat Singh's statue would been a better option than that of Lenin, Guha says, "Bhagat Singh was both an Indian and a Marxist. Yet, because the official Left had largely forgotten him, he was being resurrected and praised by Hindutvawadis." Noting that there are two reasons why the CPI(M) venerates Lenin and Stalin far more than Bhagat Singh, Guha says, "Having been brought up from an early age to worship them, they cannot think of doing otherwise. Just as boys raised as Vaishnavites can never see anything good in any other god but Vishnu (or his avatars), so devout Marxists stay dogmatically with their childhood Gods as they grow into adulthood and beyond that into dotage." "The second reason why Bhagat Singh remains a minor figure in the CPI(M)'s pantheon is that the party traces its origins to the undivided Communist Party of India, and the Sikh radical was not a member of the CPI. He was, rather, part of a different formation called the Hindustan Socialist Republican Association (HSRA)." Taking a historical view of things, Guha says, "The CPI had a base among workers in Bombay and Calcutta. The HSRA, on the other hand, was more active in northern India. So, although Bhagat Singh was a Marxist, since he was from the HSRA and not the undivided CPI, the CPI(M) may be reluctant to put up his portrait at party conferences." Pointing towards how has the Leninist dogma harmed CPI(M) in the recent past, Guha says, "Since the Great God Lenin had so long ago mandated that Leninists should not work alongside other parties, the CPI(M) did not join the Manmohan Singh government. They have paid for this error. And the people of India have paid for it too." Underlining that those who sought to have Lenin's statues erected _evoke pity and sadness", says Guha, adding, "Bhagat Singh, living in Lahore in the 1920s, had no way of knowing of the perversions and horrors of the regime that Lenin and Stalin had installed in Russia." It was only in the late 1930s, the forced famines, the deaths in the camps, and the violence unleashed on political rivals were all well documented, says Guha, adding, "In 1956, the Communist Party of the Soviet Union itself denounced Stalin. In 1989, the Berlin Wall fell, and Lenin was at last comprehensively rejected in the countries over which he had once ruled. Yet, through these decades, our own communists forgot nothing and learnt nothing." A bit harsh but very good read.